It’s been an incredible journey. A decade of work that has reached and influenced so many people around the world. But none of it could’ve happened without you. You’ve changed our lives by simply watching, telling a friend, buying merchandise, coming to a show. We are forever grateful, and we hope that we’ve been able to make you proud and give back a fraction of what you’ve given to us the past 10 years. From the deepest part of our hearts…Thank you. 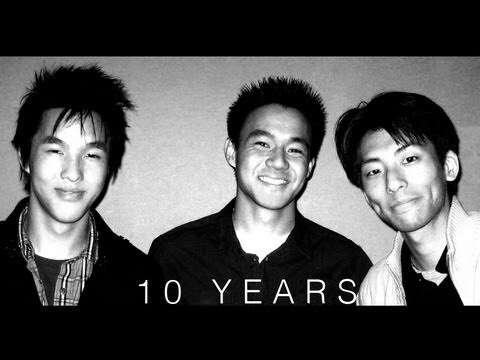 What’s been your favorite Wong Fu Production short over the past 10 years? Here’s some of our favorites : Yellow Fever, Just a Nice Guy, Strangers, Again, and Wong Fu Productions hits 1 million susbscribers. WONG﻿ FU 4 LYFE!! This entry was posted in shorts on June 12, 2013 by Kevin Hsieh - channel APA.